For the past 5 years the museum has run the Railroading merit badge program for scouts free of charge. Each year we have had to find a scout leader to sign off on the work completed by the scouts. 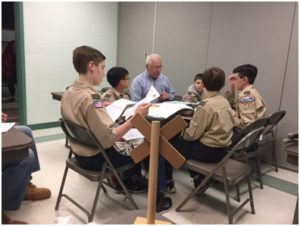 But no more, our Railroad badge Coordinator Howard Williams has secured the necessary training and education to sign the merit badge cards for scouts that attend the program. Over thirty scouts attended the 2016 workshop. The 2017 date is Saturday November 4th. Seven (including two Eagle) scouts signed-off on the badge by our very own Howard Williams. This is Troop 12, Milford, CT.